Home » bugs bunny » Disney » Elmer Fudd » Holly wood » Looney tunes » wabbit » warner brothers » whats up doc » Yosemite Sam » Eh… What’s up Doc? Remember that line? Does it remind you of the lazy Friday mornings? Where the first thing you did after prying your eyes open, was to trot to the room with the T.V. and flick through the channels till the jingles of the cartoons filled the air? Bugs Bunny had and still has the capability to make one’s worries disappear, and instead be filled with his sarcastic humour, as well as tricky, outrageous, almost unbelievable plans and plots. 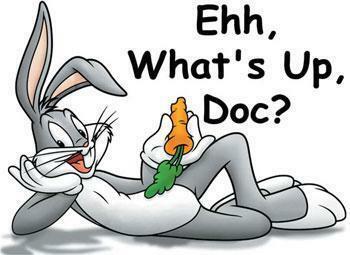 He is famous for his numerous catchphrases, the famous one being, “Eh… what’s up doc?”. Be it outwitting the fearsome Yosemite Sam or befuddling the bumbling Elmer Fudd, or scaring big orange monsters out of their wits, Bugs Bunny’s done it all. Bugs also was the first cartoon character to be immortalized on a postage stamp on May 22nd, 1997. He is also the official mascot for Warner Bros. and is the only animated character, after Disney’s Mickey Mouse, to receive a star in the Hollywood Walk of Fame. The carrot crunching grey hare or rabbit (there’s always a conflict about that), was born on July 27th, 1940 in Brooklyn, New York. This “wabbit” made his debut into the world of movies in Porky’s Hare Hunt, where Porky Pig is seen hunting an animal more interested in outwitting him rather than running away from the barrel being pointed at it. His short movie, a wild hare, was nominated for the Academy Award for best animated short film. His official name, Bugs Bunny, was introduced to the audiences in the movie Elmer’s Pet Rabbit. Merrie Melodies, intended only for one season, was renewed, due to Bugs’s popularity. He turned out to be Warner Bros. number one star. The main reason was that, during the World War II, his sassy, outrageous attitude provided a much needed relief, for the people living in war-torn nations. In 1943, the U.S. Marine Corps made Bugs Bunny an Honorary Marine Master Sergeant, after he appeared in a short, Super Rabbit, wearing a Marine Corps dress blue uniform. He continued to make cameo or guest appearances in a number of shorts, including Jasper Goes Hunting, made by rivals Paramount Picture. He pops out of the hole with his catch phrase, after which he said “Hey! I am in the wrong picture” and then goes back into the hole. The post war era proved to be eventful for Bugs, especially the year 1958. His short, Knighty, Knight Bugs, in which he finally exchanges blows with Yosemite Sam and his dragon with a cold, won the Academy Award for the Best Animated Short Film. The Duck Season/Rabbit Season trilogy in 1957, “What’s Opera Doc?”, was declared by the Library of Congress as ‘culturally significant’, and the National Film Registry selected it for preservation. This movie, showcasing Bugs and Elmer, was a spoof of Richard Wagner’s Der Ring des Nibelungen. This recent project was the Looney Tunes show that premiered in Cartoon Network last year. Warner Bros. announced that they were planning a live action/ Computer generated – animated combo feature film based on the characters of Looney tunes. The writer is a first year postgraduate student pursuing Media and Communications in Manipal University, Dubai.